Who doesn’t enjoy a treat every now and again? However, the thing about treats for kids is that they are often treats we would offer an adult. When we give children a large chocolate bar or an ice-cream these are often too big for little bodies. If you want to give your child a treat every so often, homemade is best. I’ve pulled together some healthy options below. Everyone loves chocolate! An easy way to enjoy a small amount is to dip a small nutrient-rich piece of fruit into melted chocolate. This is a simple way to get the kids involved and half a banana or a couple of strawberries dipped in chocolate is a tasty portion controlled treat. Who needs calorie-rich ice-cream when you can freeze healthy yoghurt in an ice-block holder? If you want to be particularly creative you can add some extra fruit or choc bits to the yoghurt, which will increase the sweetness. See my Frozen Yoghurt Cups recipe here. Homemade treats, like Mini Banana Muffins, are much healthier for little ones than commercial cakes and slices. When making muffins, there is the option to use fruit puree, wholemeal flour and olive oil — making it a healthy fibre-rich treat that little ones will love. See my Mini Banana Muffins recipe here. Fruit bread is another great option which can be easily made healthy with plenty of fruit, wholemeal flour and minimal amounts of added sugar. See my Banana Bread recipe here. A mix of dates, nut spread and a little coconut can turn a fruit snack into a tasty treat! Especially if a little cacao is added to give the mixture a chocolate taste. Bliss Balls are so easy and recipes can be tweaked and mixed up to suit your little one’s taste. Kids over the age of five love popcorn! You can sweeten it with a drizzle of honey or maple syrup and a few minutes in the oven to make it crunchy. However, be careful as it is a choking risk for small children. Vegetable Chips are super quick to whip up! Extremely versatile, you can use any combination of vegetables including carrots, zucchini and cheese. The inclusion of blended oats in my recipe adds a good dose of fibre and gives that extra nutty flavour that kids love! Serve with Greek yoghurt or hummus. See my Cheesy Vegetable Chips recipe here. Apple Berry Crumble is a delicious and nutritious snack — the perfect treat option for kids. Containing a mix of fruit, almond meal and oats — Apple Berry Crumble can be whipped up in under 20 minutes. Once cooked you can easily blend and mash until you reach the right consistency for your little one. See my Apple Berry Crumble recipe here. My Pumpkin Scones are scones with a twist! These yummy treats combine mashed pumpkin, milk, egg and flour to make a delicious treat for your baby. 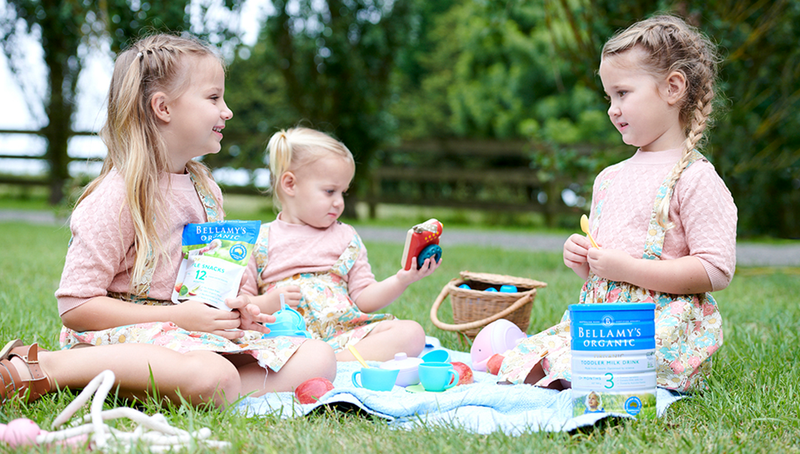 They can be served with Bellamy’s Organic Peach and Apple puree for an organic option with no preservatives, artificial flavours or colours. See my Pumpkin Scones recipe here.